This post was sponsored by Acorn Footwear. All thoughts and opinions are my own. Thank you for supporting the brands that support The Fresh Exchange every month. Winter arrived here in northern Michigan. The blanket of snow has settled into every inch of the landscape and we are in for the next few months of snow-covered life. It is beautiful and perfect, but if you are anything like us, sometimes the constant snow and gray sky above can feel relatively hard on certain days. Moving back to Michigan, Mike and I made a commitment to learn to love winter with our whole heart and to make it through the hard stages of the season. 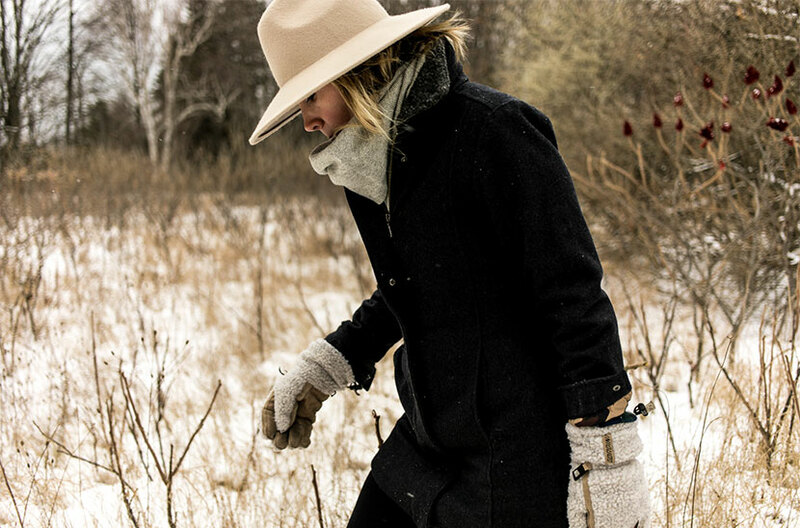 We partnered with Acorn Footwear to share these 3 tips, since their cozy slouch boots fit so perfectly into some of our ways to combat those nasty winter blues. Since Mike is from Texas these gray days were a hard transition for him, so we read and learned and finally figured out all the things that made all the difference. I will tell you that some of these were even hard for me to get into and fight my own rhythms, but they now have become such a huge part of why I love winter that there is no turning back. It seems that just simple shifts in our day and perception of life this time of year can make all the difference. 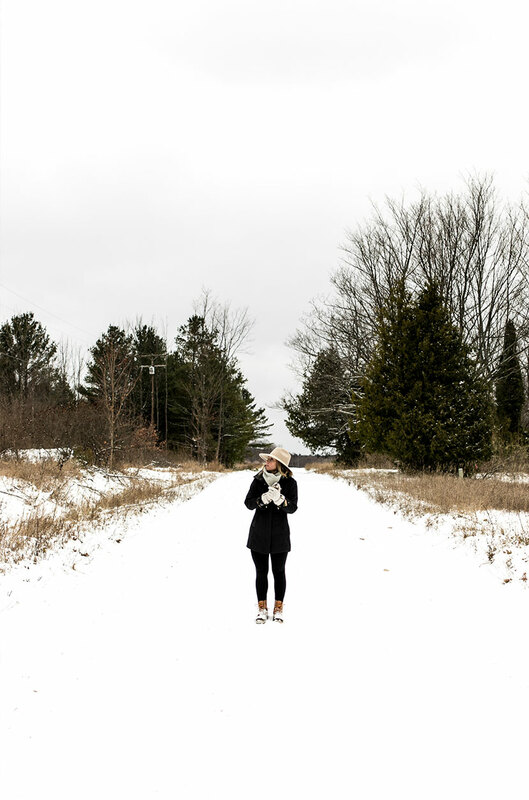 So when you feel like winter is getting the better of you, I have no doubt that adding one of these three things into your day will truly help lift your blues, and you will find yourself revived and ready for a little more winter. Oh yeah, that’s right. Every single day it is extremely important to step outside for at least 30 minutes a day. It may be hard when you work inside all day and it is dark when you go to work and when you leave, but I promise if you just take your lunch break and walk to get coffee or lunch, it will make the difference you need. The cold air is extremely good for you and will refresh you. For us, we daily take walks as a family. It helps that our mailbox is a near 1,000 feet down the road and that we have a toddler who needs to get outside, but nonetheless we choose to get out no matter what. We took up hobbies such as Cross-Country Skiing and Snowshoeing in order to get us even more excited about being out in the elements. Even on blizzarding days, we head out for a walk. The Vitamin D you get even on those days really affects you. If you are fearful of the cold, invest in great gear so you can enjoy the weather. Having items for during and after your adventures that are cozy, comfy, and easy to put on and take off will make getting out all the more enjoyable. Not to mention with all the boot wearing (especially ski boots) it is nice to have some post outdoor adventure footwear as well. My Acorn's are one of my favorite ways to let my feet recover aprés-adventure. 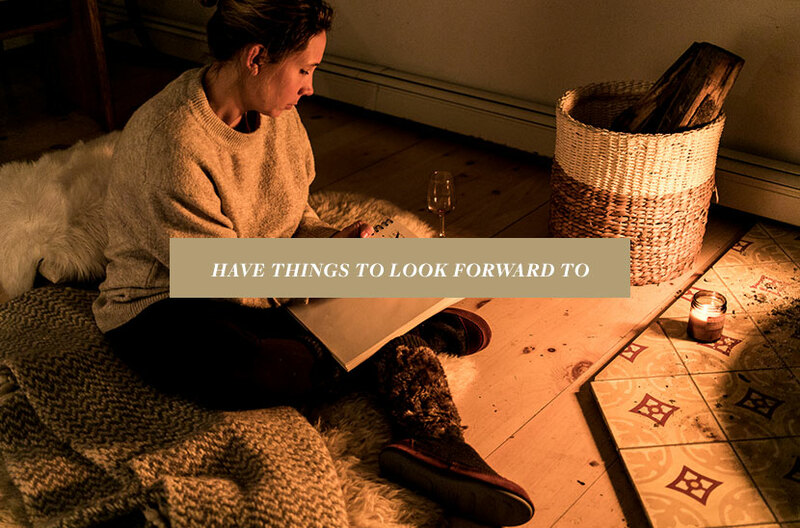 Whether you have a fireplace or a few awesome candles, the practice of getting cozy with low light, warm tea or other favorite drinks is the perfect way to enjoy the early sunsets on these winter days. 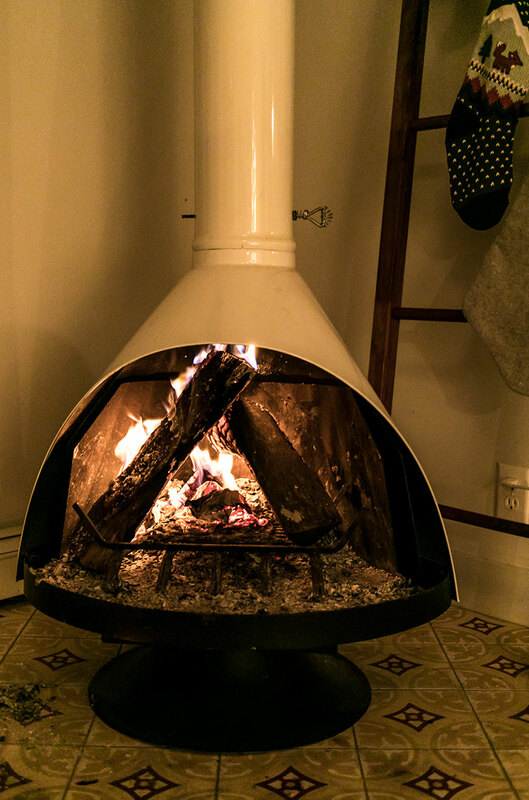 As the wind blows outside, gather a friend and sit near the fire or light a room with candles. 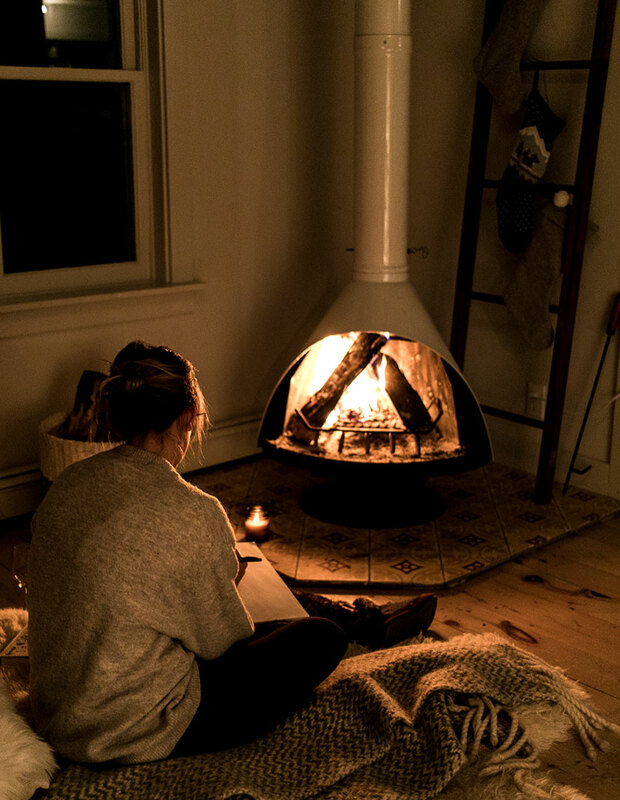 Enjoy the warmth the light of a fire can make in your soul and space. 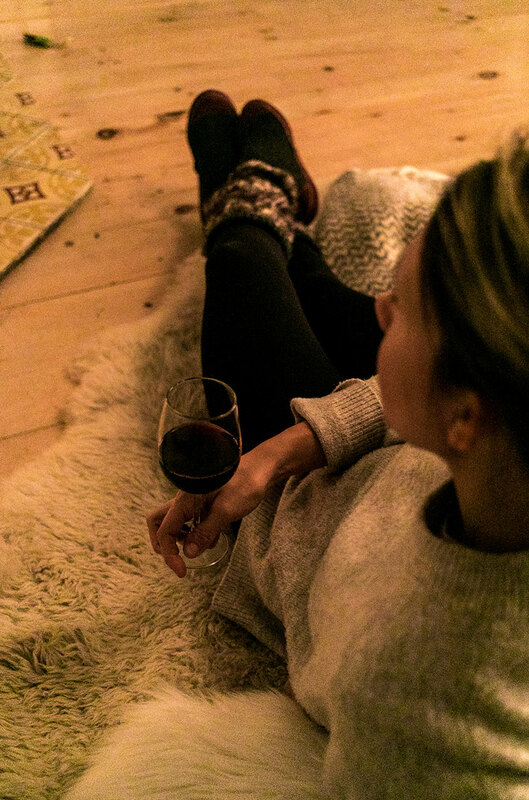 For the perfect after adventure feeling, layer on cozy clothing such as your favorite leggings, Acorn Women’s Slouch Boots, and an oversized sweater. I love the Acorn Women’s Charcoal Fur Slouch Boots in particular. 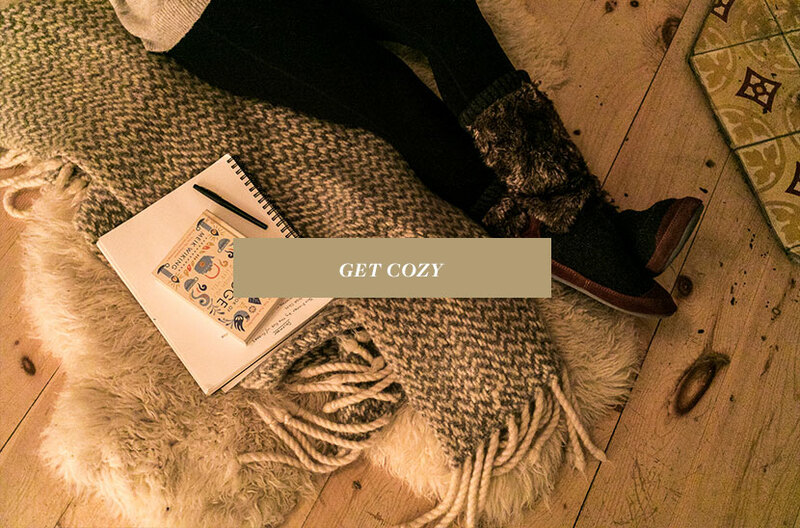 They have a no-slip, indoor/outdoor bottom and suede toe and heel that help keep you extra warm; perfect for wearing while running errands, walking to yoga class, or at home after time outside. Make sure to have some warm furs and blankets to simply enjoy the stillness that winter has to offer. I find the blues come for me if I fight the reality of what we should be doing in winter. If we try to keep rhythms we did a few months ago instead of embracing the rhythms of the season we are presently in. One of my friends talked about this and thought it was brilliant. During the hardest months of winter, making a point to write a list or make a calendar of things to look forward to is a great way to keep your spirits up through the winter. I find that planning dinners out or in with friends, new books to be read, a new project to tackle or even just a special treat in the middle of the day makes the days seem lighter and fuller. 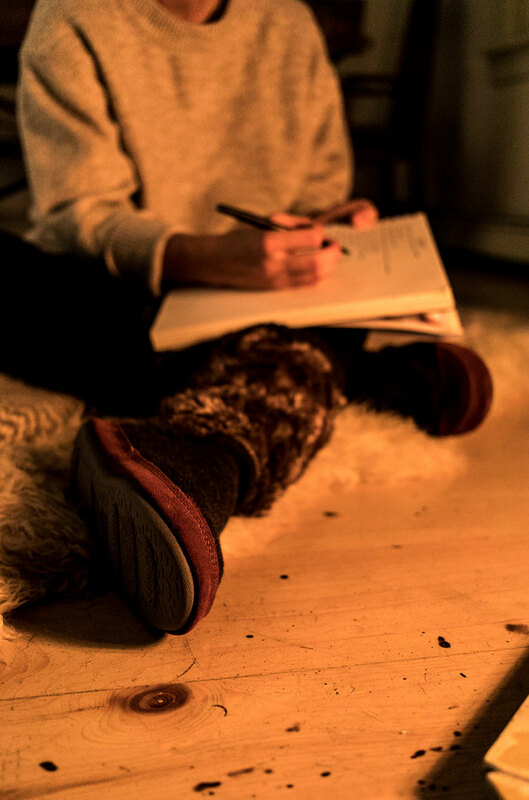 One of my favorite things to do is to plan workouts ahead of time like a yoga class (a hot yoga class on really cold days) and then make a point of coming home and getting cozy by a fire with my favorite relaxing things to wear like my Acorn Women’s Slouch Boots. These things will keep your head up and looking beyond the gray day that was getting to you. To get you excited to enjoy these three simple things, I have a short video to take you through my ways of doing these things. I hope you enjoy! So tell me what are your favorite ways to fight the winter blues? Do you have anything you do to make yourself healthy and its best through the season? Ah yes! Getting outside every day sure helps! !